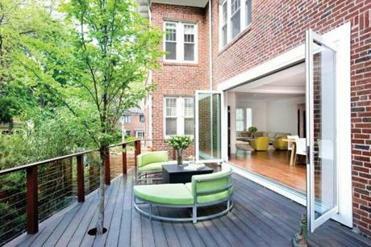 Sixteen-foot accordion doors open onto a new deck, nearly doubling the living space when the weather is nice. On Kim’s recommendation, the Heubergers enlisted kitchen designer Charlotte Bogardus of Kitchens by Coco to fine-tune the layout of cabinetry and appliances. Design and color consultant Shelley Reed, who had worked with the couple on their previous home, guided them in choosing finishes and furnishings. “We didn’t make a move without first running it by Shelley,” says Julie. And builder David Cohen of Hampden Design & Construction in Newton brought the project to the finish line, she says. The linear kitchen features a 16-foot island. While the design team initially discussed using one of the high-end Italian or German kitchen cabinet companies known for a minimalist aesthetic, they ultimately opted for custom millwork handcrafted by Fall River—based East Bay Cabinetry, a local and more cost-effective solution. A flush expanse of smooth ash panels, with limited hardware, spans the back wall from floor to ceiling. Forming a perfectly symmetrical arrangement, pullout pantries anchor each end, one flanked by an oven and microwave and one by a camouflaged 30-inch refrigerator. In the center of the wall of cabinets, disappearing doors hide a niche for smaller appliances and auxiliary counter space, under which are two sets of fridge and freezer drawers. Stainless steel tops the island. “I like it even more,” Julie Heuberger says, “now that it’s a bit beat up.” The stainless double sink, which was welded to the countertop for a seamless effect, resides in the middle of the island, making room for seating on one end. A quick-to-cool induction cooktop, placed away from the seating for safety, was installed at the other end. 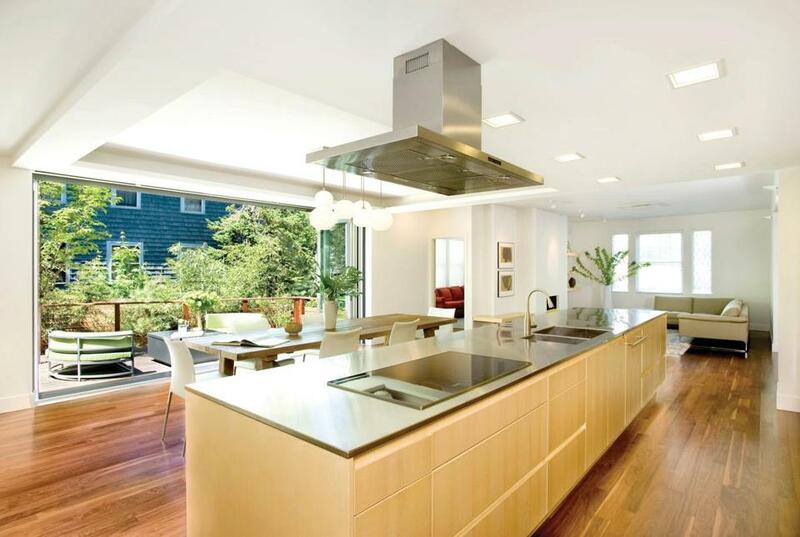 A pared-down hood reads like a piece of contemporary sculpture, while two neat rows of LED panel lights are recessed into the soffit, which Kim used to define the approximately 16-by-16-foot kitchen and dining area. When she pulls out the family’s original wish list, Julie thinks, Wow, we did pretty well. Even the boys’ friends, who are normally interested only in sniffing out where the video games are, comment on how cool it is, she notes. Try these tips for making modern more welcoming. 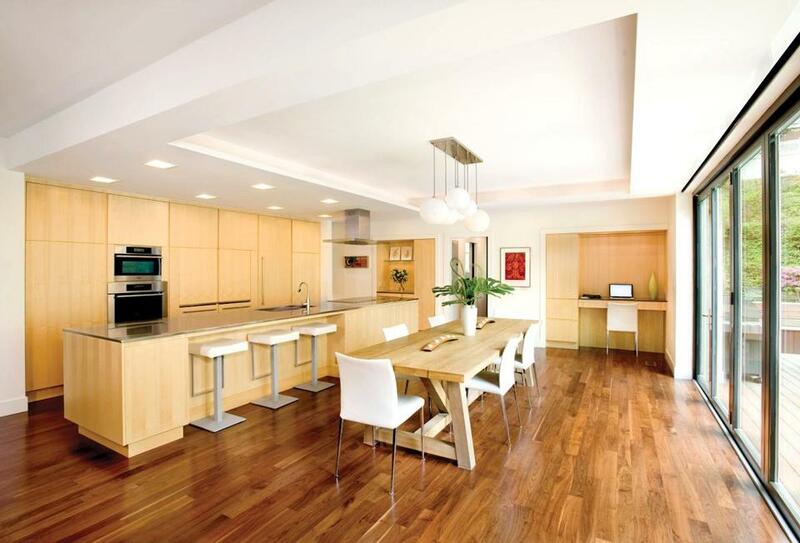 > Mix wood types, like this pairing of walnut flooring with golden highlights and ash cabinetry. > If opting for white walls, choose a warm tone, such as Benjamin Moore White Dove, used throughout the condo. > Select cabinetry in wood tones rather than white; they’re warmer, and the cabinets look more like furniture. > Achieve an airier effect with a higher-than-standard toe kick for kitchen cabinets. > Pay attention to details: A tiny indentation at the top of the island makes the countertop seem as though it’s floating. > Incorporate rustic, earthy elements to contrast with sleeker finishes, such as the outdoor table from Restoration Hardware in the dining space. > Bring the outdoors in with plants and verdant colors, like the chartreuse armchairs by Ligne Roset in the adjacent living room. > Mix in rounded shapes to offset sharp lines, such as the circular patio furniture by Tropitone on the deck.